The K-9 Unit consists of four deputies and four trained police dogs.The deputies, as well as the canines, must be trained and certified in tracking (human scent), building searches, article and evidence searches, area searches for lost and missing persons, obedience, handler protection, criminal apprehension and narcotics detection. The K-9 Unit trains in these areas weekly to stay proficient in these special skills. Recertification is required yearly to validate the K-9 teams for court testimony. The K-9 Unit's requests for service include incidents of breaking and entering, armed robbery, homicide investigations, escapes, missing persons, and narcotics investigations. The narcotics canines are also trained to detect the presence of narcotics odor on U.S. Currency, which has been seized by officers. K-9 teams are also utilized on raid entries to assist WEMET and our Critical Response Team in making safe entries into buildings. One of the fundamental responsibilities of the Sheriff's Office K-9 Unit is providing demonstrations to interested citizen groups and community members. These demonstrations highlight the abilities of the K-9 team and show the public how their skills are applied to law enforcement and public service efforts. Groups include churches, Boy Scout troops, fundraisers, public safety open house events, parades and local festivals. The K-9 Unit appreciates the support offered by the community and looks forward to additional public demonstrations upon request. The Sheriff's Office K-9 Teams are proficiency certified through the North American Police Work Dog Association and must recertify annually. K-9 teams certify in a number of areas, including tracking and narcotics detection. 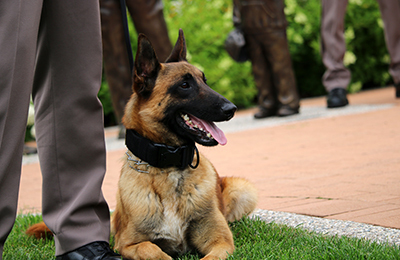 Certification enables deputies to testify in court regarding the abilities of the K-9 Team. Additionally, the K-9 Teams train weekly as a group, as well as with other area law enforcement area K-9 teams to insure an ongoing and high level of skill proficiency.